There were rumors and whispers of a trade truce between China and the US. Wages domestically grew by the most since 2009, better than 3% last month. OPEC is going to be cutting oil production again. And most of all, for the mainstream narrative anyway, the Fed is about to go on a break. Why didn’t markets react positively to all the good news? Prices have been bid over the last three days like we haven’t seen since the last couple of weeks in May leading up to May 29. That means expectations for lower overall interest rates in the near-term years ahead, starting in 2019 (where the inversion begins). But as predicted rates seem lower (higher futures prices) the curve has inverted even more right in this space. In other words, the market is saying that not only is Powell more likely to be wrong (about inflation and economic acceleration) the more he confirms these concerns the greater the probability they turn out even more significant than they seemed yesterday. If the Fed Chair of all people can see it, then it really can’t be good. 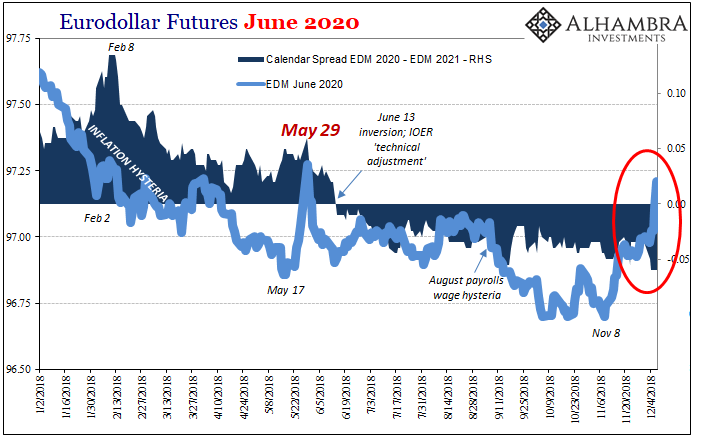 Ironically, that’s what the curve is saying a little further out to 2022. 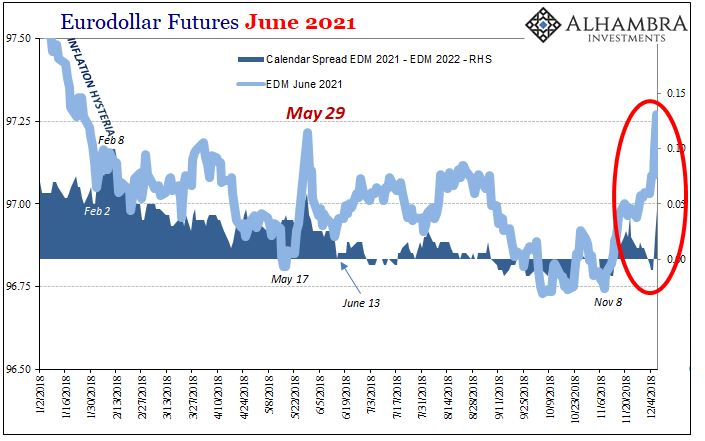 The 2021 to 2022 calendar spread had been negative (inverted), too, but over the last two days, it has really steepened as investors pile on the Fed pause. It’s not a positive sign at all, not with the 2020 to 2021 spread more deeply negative alongside. This suggests the market is zeroing in on downside risks and they aren’t as distant or fuzzy as perhaps banks (that’s who is in this market) were thinking before. The problems, or, more accurately, the consequences of economic and monetary destabilization, are being judged closer to now (and more likely) than they were over the past few months. This is why during a week when the Fed’s display of confusion hit the tape across-the-board money rates more broadly rose. If there are fewer perhaps not even any more “rate hikes” in the near term, why does LIBOR keep going up? What has the GC repo (on any collateral) rate jumping through the roof?